Mac Pro 2013 Tech Series Part 4: Connecting a displays and using multiple displays - Sewelltech, Inc. In our previous post Tech Series Part 3, we talked about Using USB 3 devices, today in Part 4 of a 6 part series we will talk about Connecting a displays and using multiple displays. Learn about using multiple displays (such as monitors, TVs, and projectors) with your Mac Pro 2013 via Thunderbolt, Mini DisplayPort, and HDMI connections. What display configurations can I use with my Mac Pro 2013? You can connect up to six displays to your Mac Pro 2013. Check the list below to be sure you’re setting up your display in a supported configuration via the HDMI and Thunderbolt ports. Note: Windows has different specifications for connecting multiple displays. Two HDMI (HD or 4K) devices: one connected via HDMI and one connected via Mini DisplayPort with an HDMI adapter (see note below). Note: Attach displays to different Thunderbolt busses when possible (see figure below). Do not attach more than two displays to any Bus. This means that if you use the HDMI port, be sure to then only use one of the bottom two Thunderbolt ports (Bus 0). Which 4K displays can I use? You can use the Sharp PN-K321 and the ASUS PQ321Q with the Mac Pro (Late 2013). These displays require using a Mini DisplayPort to DisplayPort cable or a High-Speed HDMI cable to connect to your Mac Pro. European versions of these displays do not include an HDMI port. Note that these displays default to 30 Hz (instead of 60 Hz) and need to be manually configured to 60 Hz using the display’s built-in controls. For the Sharp PN-K321, you can modify this under Settings > DisplayPort STREAM. For the ASUS PQ321Q, you can modify this under OSD menu > Setup > DisplayPort Stream. European versions of these displays do not have an HDMI port. Some Windows 8 applications might display only half of the screen on a 4K display when using 60Hz. Change the 4K settings on the display using the display’s built-in controls to 30Hz to display a full screen when using these applications. Can I use more 4K Ultra HD TVs in addition to one connected to the HDMI port? Yes. You can connect one additional 4K Ultra HD TV by using an adapter that conforms to the High Speed HDMI cable standard and connecting it to a Thunderbolt port. Check with the manufacturer of the cable to determine if it supports this standard. Do not use Thunderbolt Bus 0 to connect this additional device if you’ve connected a 4K Ultra HD TV to the HDMI port. Are display rotation and scaling supported with my connected 4K Ultra HDTV or 4K display? Scaling and display rotation are supported for a 4K Ultra HD TVs or 4K displays using the HDMI port. When rotating a 4K Ultra HD TV or 4K display at 90 or 270 degrees, the resolution will change to 1080p. Can I connect DVI displays? You can use two DVI displays with your Mac Pro 2013. If you connect a third display via HDMI, it will cause one of the three displays to become inactive. To avoid this, consider using Thunderbolt, Mini DisplayPort, or VGA for connecting additional displays if you are already using two DVI displays. Which displays are active during startup? Usually only one connected display will illuminate until OS X is finished starting. Can I use an Apple Thunderbolt Display and an iMac in Target Display Mode to act as two additional displays for my Mac Pro 2013? Yes. If your Thunderbolt-equipped Mac supports two Thunderbolt displays this is possible. 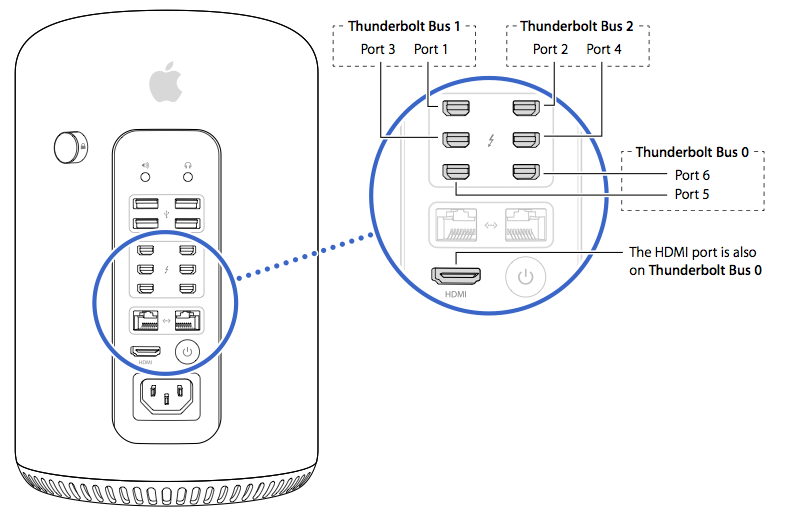 Your Thunderbolt-equipped Mac will need to be connected to your Apple Thunderbolt display and the iMac will need to be connected to the Thunderbolt port of the Apple Thunderbolt display. Once connected, place the iMac into Target Display Mode to enable it as the second external display. Make sure the Thunderbolt Display is connected to your Thunderbolt-equipped Mac and is being recognized and used by the Thunderbolt-equipped Mac before connecting the iMac to the Thunderbolt display. 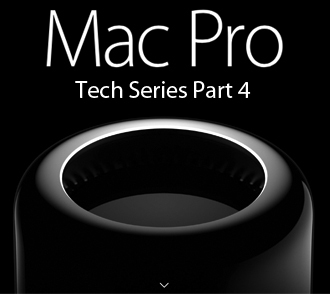 If the iMac is placed in the Thunderbolt chain before the Apple Thunderbolt Display, the Thunderbolt display will work as an external display for the iMac and it will stay active as an external display for the iMac, but it will not function with the main Thunderbolt-equipped Mac using the iMac’s display. To use an iMac in Target Display Mode when connected to an Apple Thunderbolt Display, the iMac must be Thunderbolt-enabled, and a Thunderbolt cable must be used (not a mini-DP cable).